We’re thrilled to announce $24M in Series B funding lead by Cox Automotive—owner of AutoTrader, Kelley Blue Book and Manheim Auctions. This marks an important milestone in the Getaround story and we are beyond excited by what it means for our community and the future of peer-to-peer carsharing everywhere. Through its portfolio of companies, Cox reaches more than 32 million car consumers each month and facilitates the marketing and sales of tens of millions of vehicles each year. Together, Getaround and Cox are excited to work together to change the way people own cars by expanding access to shared vehicles. WHAT DOES THIS MEAN FOR THE GETAROUND COMMUNITY? We’ve spent the last year focused on creating a truly on-demand carsharing experience and fine tuning our product to make it as seamless as possible at home in San Francisco. With this latest round of funding, we are excited to bring the Getaround on-demand experience to other communities across the country. Over the last year, our team has been focused on the product developments needed to make on-demand car sharing a success. We’re excited to keep developing our website, apps and Getaround Connect™ to provide more tools and resources for owners sharing their cars on Getaround. We’re also excited to bring the on-demand Getaround experience to major US markets, starting with Oakland, Portland, and launching on our first East Coast city, Washington D.C, in early 2015. Based on what we’ve seen in San Francisco, we know that owners sharing their car on-demand earn 5x more than those sharing their cars via the request-based system, earning an average of $6,250 each year. This is great news for Getaround owners everywhere. On top of our funding and expansion news, we are excited to release our first-ever Android app. 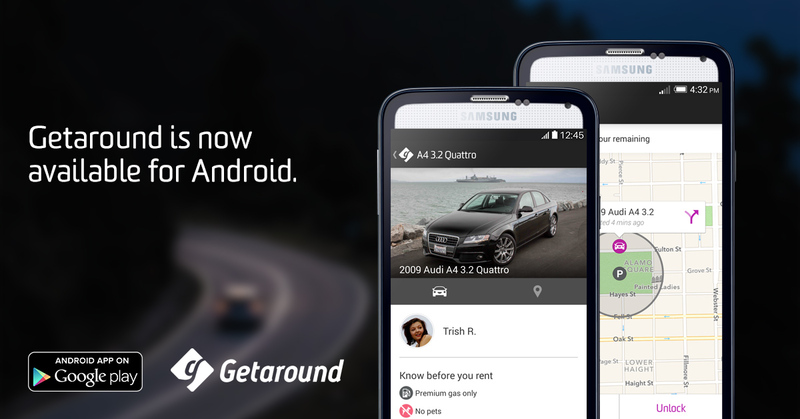 With the full set of features available in our iPhone app, Getaround for Android makes renting a car instantly, on-the-go easy for all Getaround users. As always, the list of amazing cars being shared in the Getaround community continues to grow. In addition to daily drivers like smartcars, Prius’ and Honda Civics, we have amazing cars like Audi R8s, Teslas and Porsches available for rent instantly in San Francisco. We can’t wait to see what cars our community will add to the “Getaround garage” in our next cities. Thank you for all your support, we couldn’t have done this without you! 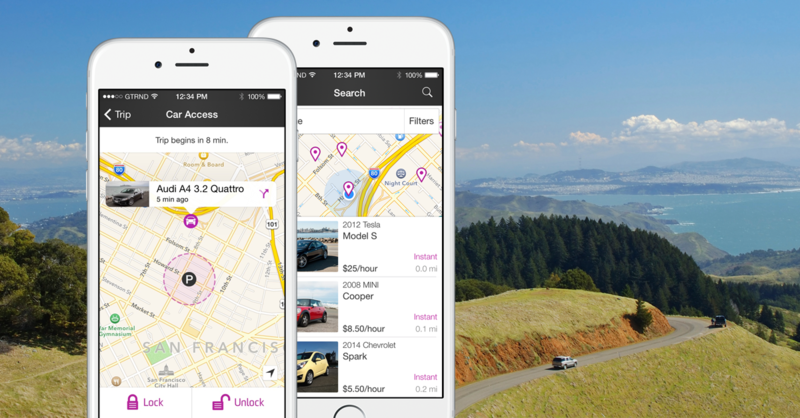 Renting a car on Getaround just got even easier. Starting today, Getaround users can opt to pay for their next trip using a debit or credit card stored in their Apple Pay account.